Mr. Gnome finally has a proper home! And his Aunt has also moved in! The Gnome Home retails for $70 USD/$90 CAN and is very sweet. I like the detail on the top, so that we know it’s a tree stump. 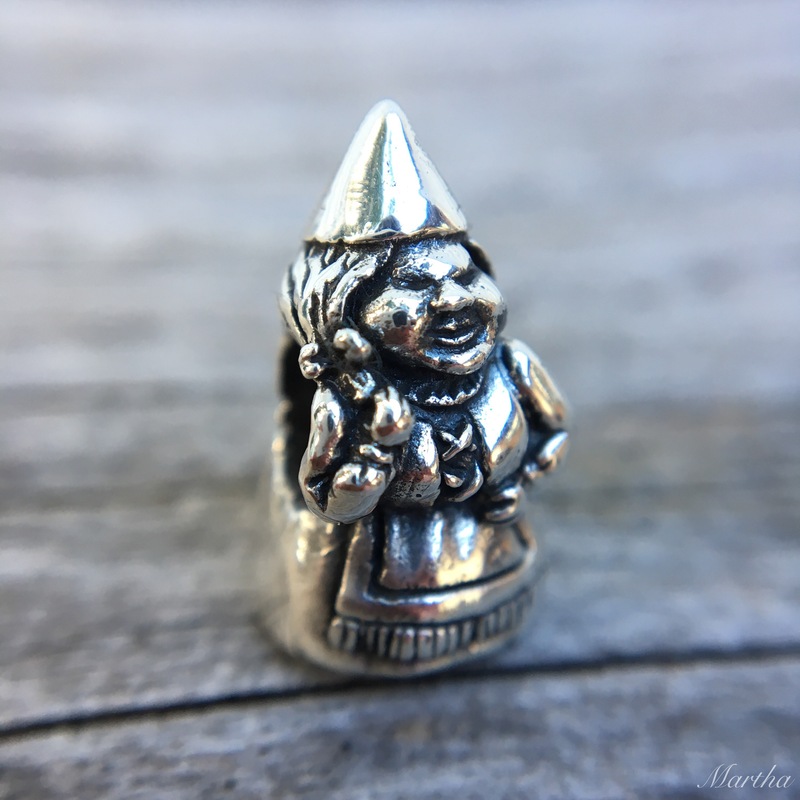 Aunt Gnome costs $45 USD/$55 CAN. The little bow on the back is just adorable. The cutest part is the little shoes! Obviously they needed their own bangle and I added the two glass beads called Luminous and Reflections. To embrace the feeling of warm tones one might find in the woods I made up a quirky bracelet. Here, I think that Aunt Gnome had some chocolate, then took a nap and had a dream about zombies. While this was going on I think OG was out picking apples and strawberries to make some cider. Below left to right are the Bare Clips, Jiangshi, Hot Chocolate, Aunt Gnome, Bar Brawl and Rose. 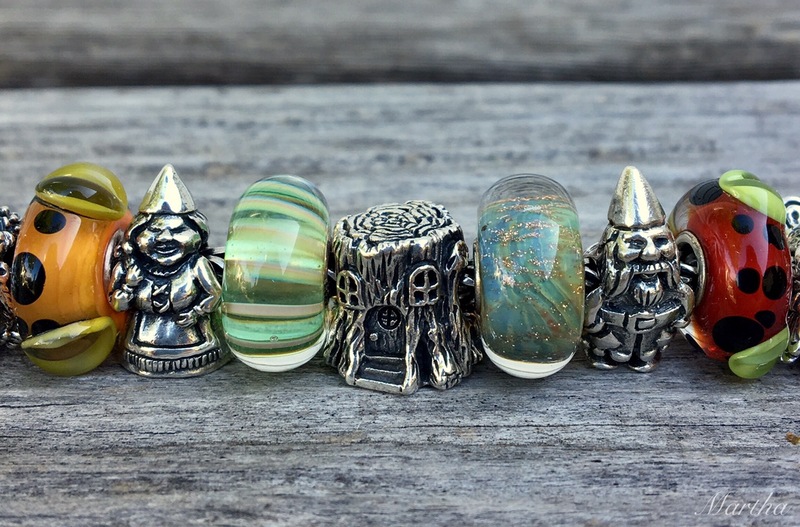 Below left to right are Strawberry, Gnome Home, Incremental Change, Mr. Gnome, Mulled Cider and Ohm Jar. Lastly, I wanted to make a large woodland creatures themed bracelet. For this I’ve added in some Redbalifrog silver pieces and Trollbeads glass. Below left to right are the Redbalifrog Cardinal, Aqua Edge Triangles, Redbalifrog Nest, Aqua Edge Pumpkin and Ohm Beads Mama Terra. 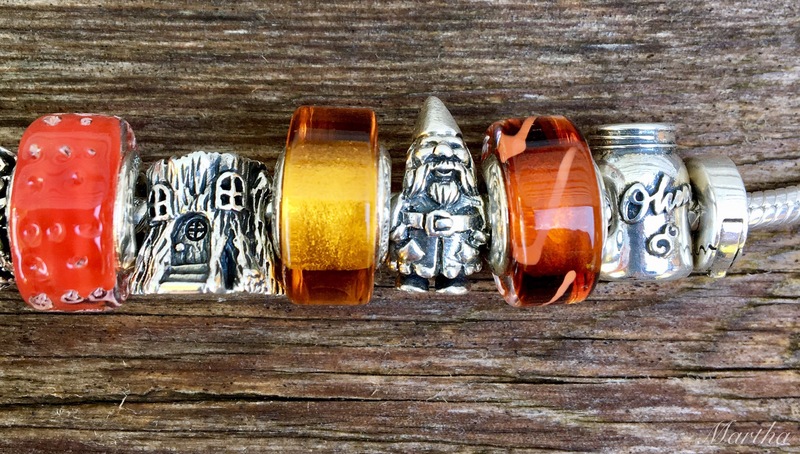 Below left to right are Orange Pod, Aunt Gnome, Wise Bamboo, Gnome Home, Rainbow Bridge, Mr. Gnome and Red Pod. Below left to right after the Red Pod are Ohm Beads Tom the Dead, Aqua Edge Petals, Redbalifrog Owl Nest, Green Pod and Redbalifrog Night Owl. 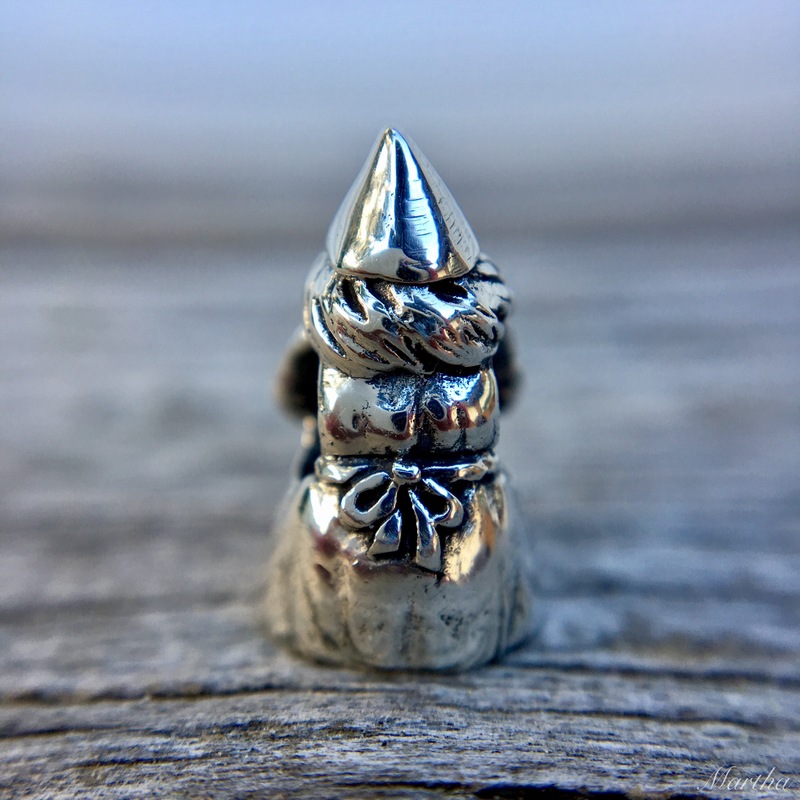 Hope you’ve enjoyed this look at the new additions in Ohm Gnome land. I was especially thrilled with the little house, as I can totally imagine it out in the woods somewhere. 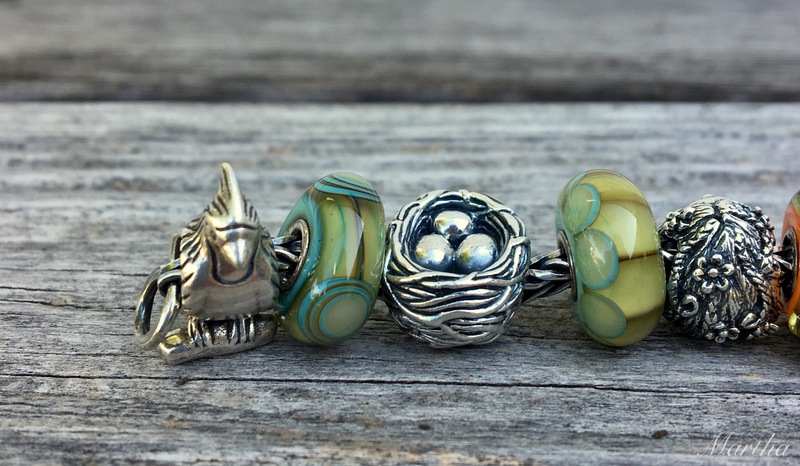 Did you get either of these new beads? Aunt Gnome in the USA is here. Aunt Gnome in Europe is here. Gnome Home in the USA is here. Gnome Home in Europe is here. 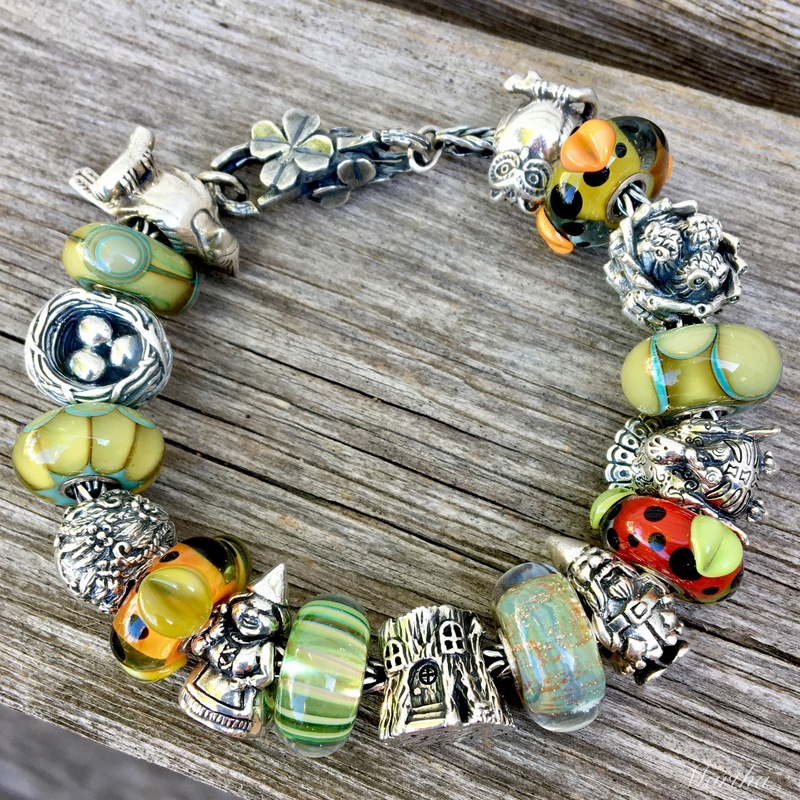 Coming up next week is another travel inspired post, this time for Syria and Lebanon, some bead inspiration for the upcoming Trollbeads USA sale and the Trollbeads Dancing Butterfly Spacers and Earrings. The top of the stump is adorable and so is the underside of Aunt Gnome. 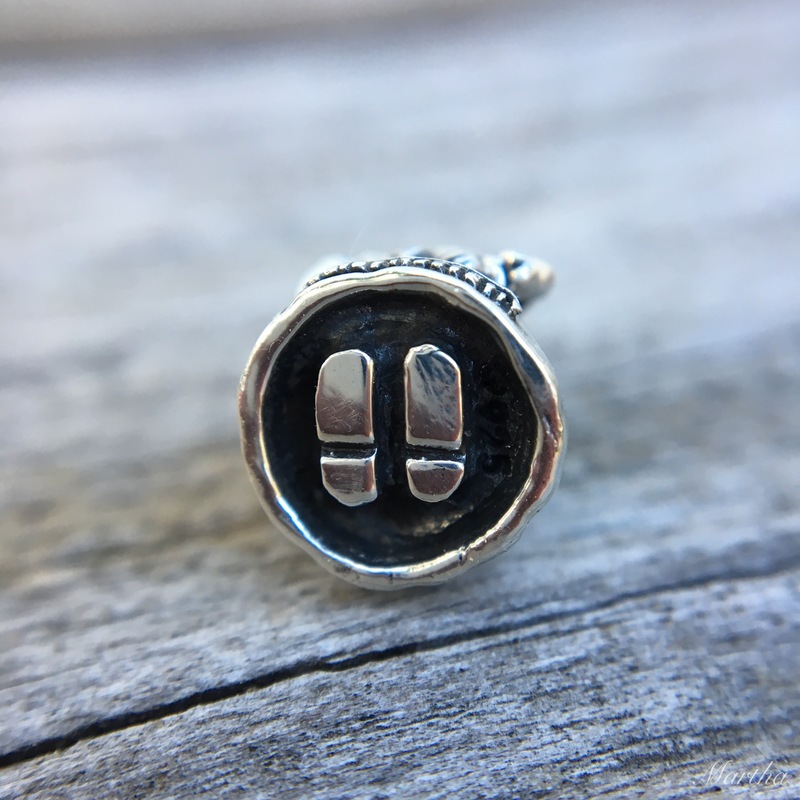 Ohm’s attention to details in their new silver beads is great (thinking about the UFO). I really love your cider color palette. 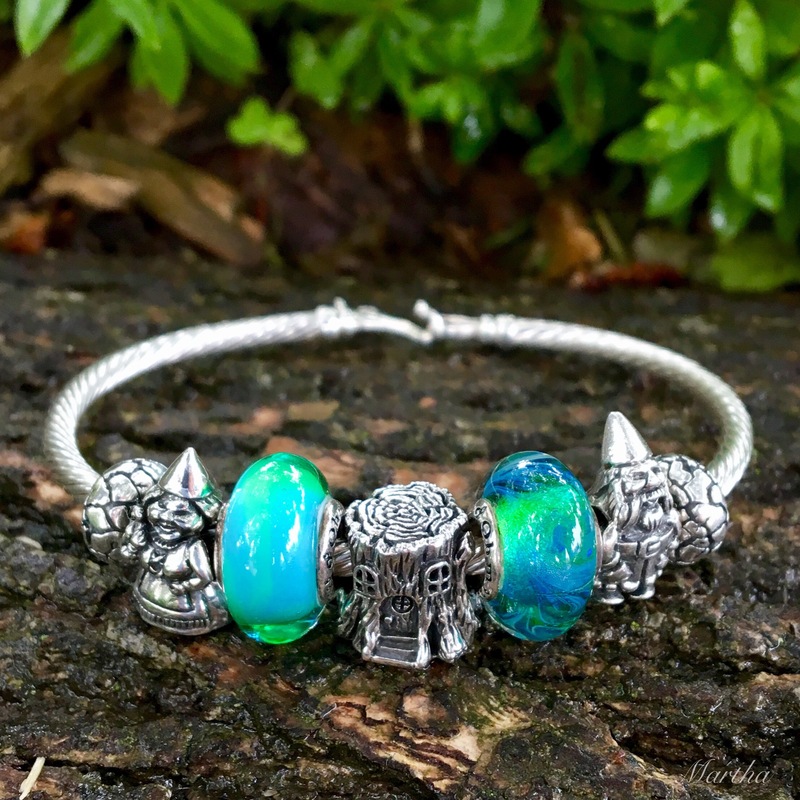 I also like how you added some woodland creatures in the last bracelet. 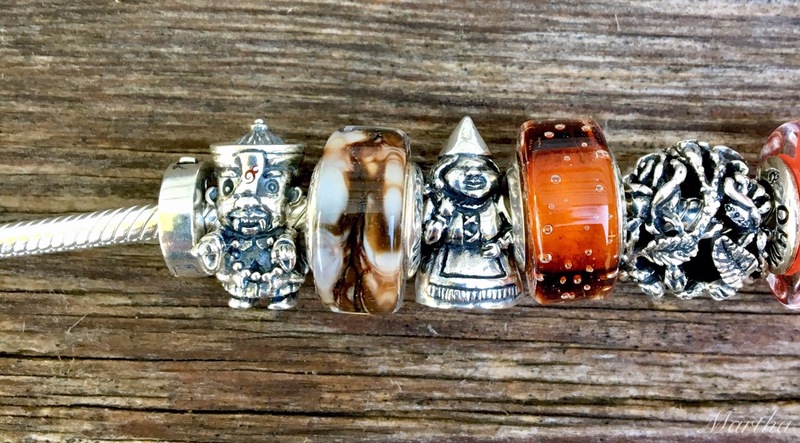 It’s interesting how well these two new Ohm Beads blend in with the Redbalifrog silvers, which have always been known for their detail. I was so happy when I looked at the underneath part of Aunt Gnome and saw her little feet. Often we don’t see these little things in stock photos, so it was a pleasant surprise! 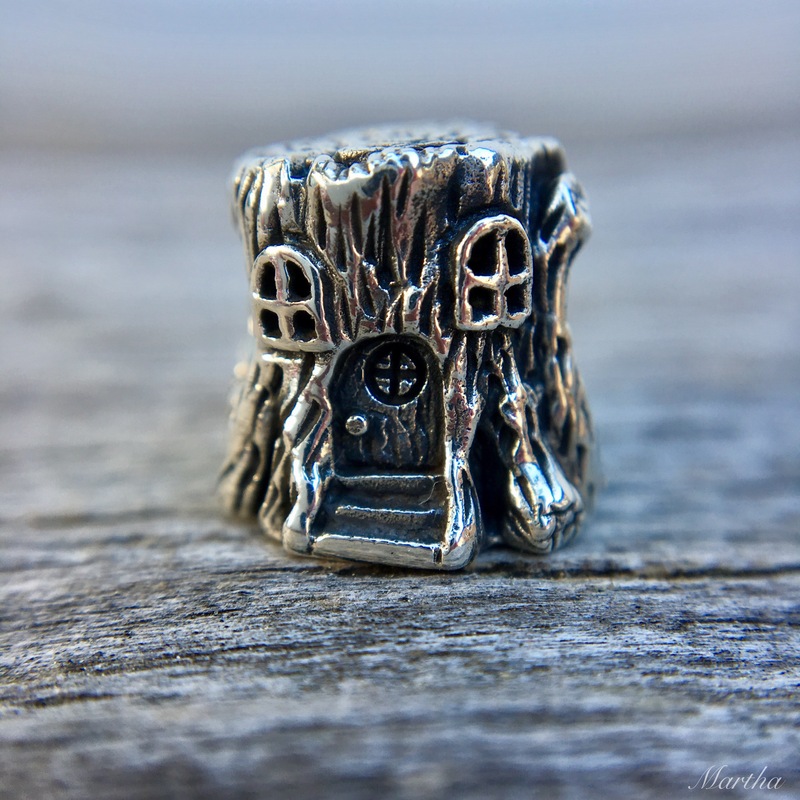 I just adore how the house is a tree stump-almost like the gnomes want their house to blend in with the surroundings, or I guess really it’s just what they found to make it with. Good grief, I’m talking like they are real little creatures. Happy Friday, April! Happy Friday! The more attention is put into the details, the more fun you’ll have with them and appreciate them. They really do go well with the RBF beads. Hi Martha, I always love to see the combinations you design. 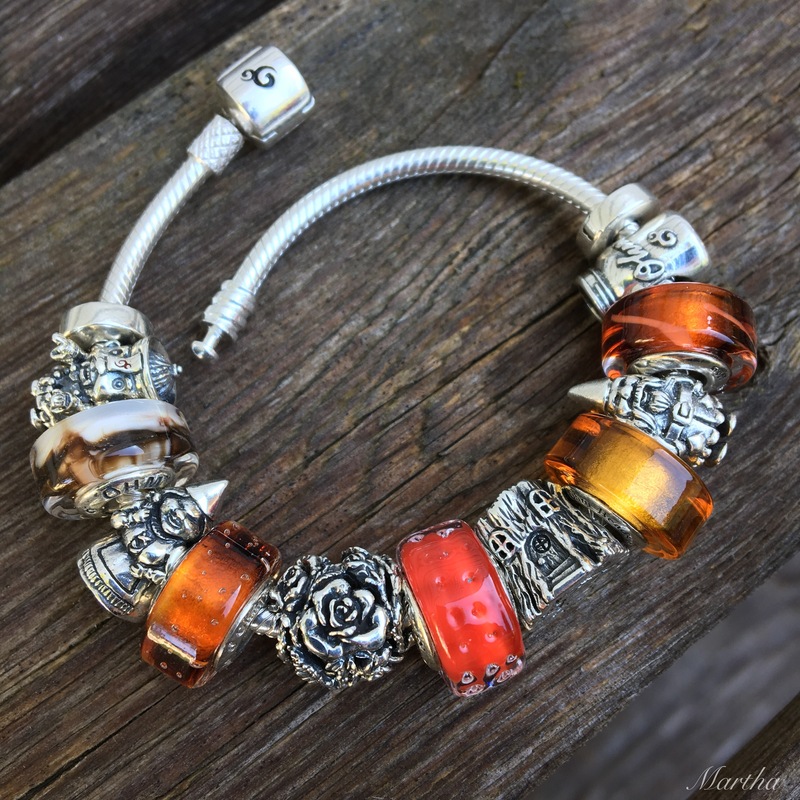 Sometimes a bead becomes alot more desirable to me after I see it on one of your bracelets. Today that would be Mr. Gnome and Aunt Gnome. I already knew I liked the Gnome Home….and I guess you’ve got to have gnomes to live in it! LOL, I guess you’re right Suzanne-a home need someone in it. And the list continues! My Ohm list is REALLY long as I currently only have a few of their beads. Between all of the retired beads I’m looking for and then the new ones there are a lot of must-haves. But I do love getting that Beadmail! What’s this talk about not needing any more beads??!!! 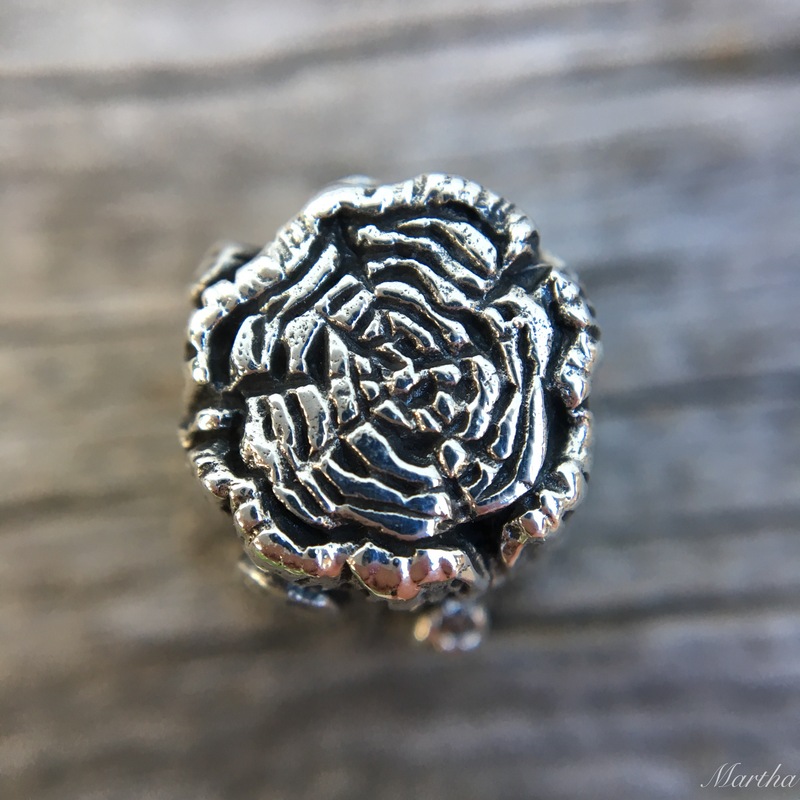 I do not know if I get a bigger kick out of your jewelry styling or storytelling! Your creativie blog never fails to put a smile on my face! You must have quite the stock of beads by now. Could you one day share with us how you keep it all organized? I would love to learn all about it! BTW, you have a beautiful version of Rainbow Bridge there! My two are yuck horrid blah. Glad you liked the themed bracelets, Faye. I totally lucked with that Rainbow Bridge and it looks amazing in certain light, like on cloudy days. I just used Google images to look at other ones and just about panicked that I am mixed up about the name as mine is much darker than other ones, so I see what you mean. I’ve seen huge variety in Rainbow Bridge, I just didn’t get lucky with my two. I DO have a beautiful Shades of Peace though which I treasure and appreciate. 🙂 Ah it’s the little things in beads. Don’t you love Auntie Gnome’s feet and the top of the gnome home?!?! I hadn’t ever seen those details before. Oh yes, the little feet are so cute! I almost gasped in delight when I turned her over and saw them. The top of the home is what makes the bead, in my opinion. It really makes me imagine little gnomes in the garden or forest.